6. A Metal box for enclosing the charger. Here the charger uses 14-0-14 V 5 Amps Transformer. 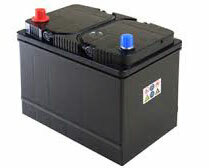 Battery needs more than 2 volts higher than its rated capacity for steady charging. 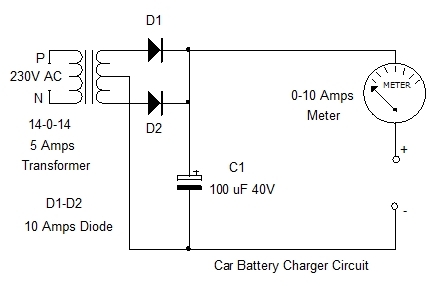 If we use 12 volt transformer, output voltage may reduce below 12 V if there is voltage drop in the Mains. This causes improper charging. If the battery is aged, it needs a force charging initially. So 5 Amps transformer is selected. Transformer gives low volt AC between 14 V to 16 V which is rectified into DC by the 10 Amps diodes D1 and D2. Usually a large value Capacitor is used to filter AC ripples from DC. But here a low value capacitor ( C1) is used since some ripples in the DC is good for Lead Acid battery charging. A kind of pulse charging takes place when the ripples present in DC. You can also avoid that filtering capacitor. Connect the Ampere meter in series with the Positive. From the Meter connect the Red wire with the Battery clip at the end. Similarly connect Black wire to the Negative side. Double check the polarity before connecting to the battery. No LED indication is provided since it may drop some output voltage. Meter gives good indication for charging. Its needle rises to 2-3 Amps initially and when the battery charging completes, needle returns to zero.